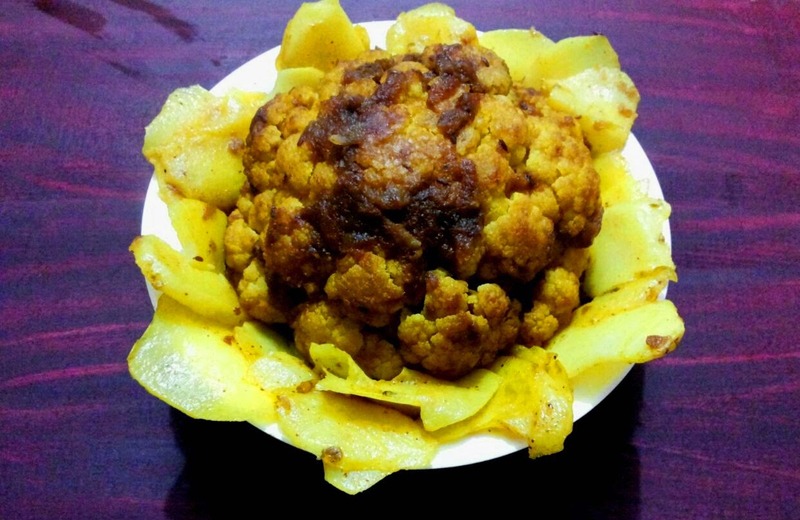 A work of art,a spectacular view,eyecandy,any word is just not enough to describe this tandoori cauliflower. Bring a large pot of water to boil.Add turmeric and salt to it.Immerse head of cauliflower in it and let it cook for 15 minutes till tender and blanched. Take a pan,add onion paste to it and saute till brown.Add ginger garlic paste to it and let it cook for 2 minutes. Add turmeric powder,red chilli powder,coriander powder and garam masala to the mix.Add water and let it cook for 3 minutes.Add salt and let it simmer. Now once masala mix cools a bit,carefully stuff the head of cauliflower with it.Fill in between all florets and underneath too. 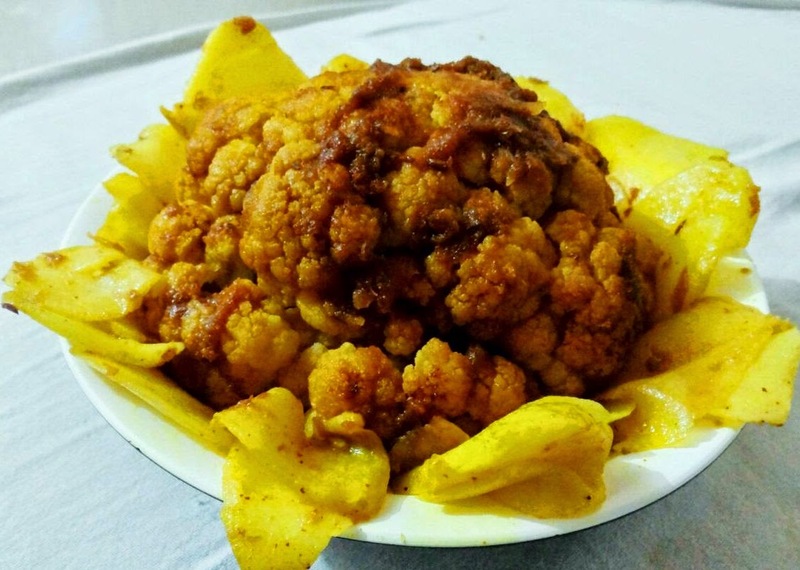 In the pan of masala mix,place the stuffed cauliflower.Add oil,let it simmer.Add water and cover it with a lid.Let it cook for 5 minutes.After 5 minutes,take it off heat. Now for garnish,take another pan.Add oil to it,toss sliced potatoes,water,turmeric powder to the pan.Cover the pan and let it cook for 5 minutes.Once potatoes are soft,take it off heat. Serve the hot cauliflower with sliced potatoes and any Indian bread.